In this article, we shall look at the causes, clinical features and management of the patient with chronic mesenteric ischaemia. The gradual buildup of atherosclerotic plaque causes narrowing of the blood vessel lumen, reducing blood flow and resulting in ischaemia to the bowel. 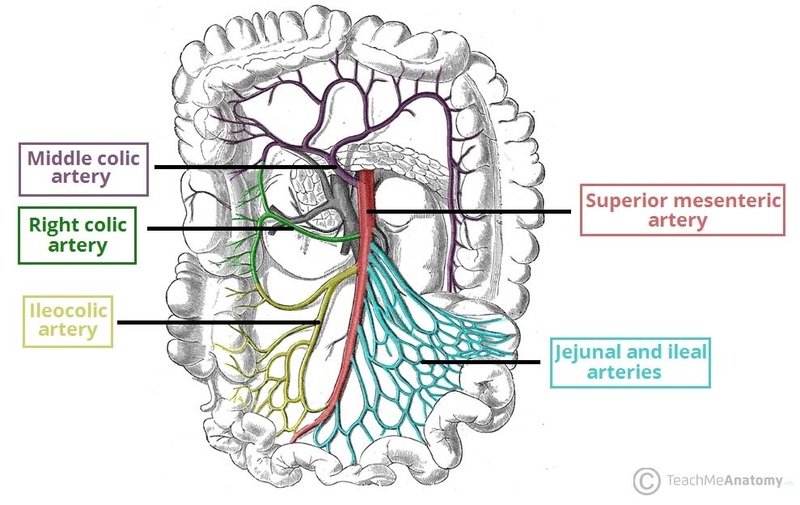 The degree of communication within the visceral blood supply means that in the majority of circumstances at least two of the CT, SMA, and IMA must be affected. When there is an increased demand on the blood supply (such as when eating) or reduction in supply (i.e. hypovolemic states) in patients with chronic mesenteric ischaemia, a transient ischemia of the bowel occurs, resulting in symptom onset. Chronic mesenteric ischaemia occurs mostly in patients >60yrs and more commonly in females. Patients with atherosclerotic disease in the mesenteric vessels are often asymptomatic, and as such the condition is typically under-reported. However the prevalence of atherosclerotic involvement in the mesenteric vessels has been reported between 30-50%. The main risk factors for chronic mesenteric ischaemia are smoking, hypertension, diabetes mellitus, and hypercholesterolemia. Other less specific symptoms may include change in bowel habit (typically loose), nausea, and vomiting. Examination findings are often non specific; evidence of malnutrition/cachexia, generalised abdominal tenderness, and abdominal bruits may be present. Often a patient has undergone several other investigations for other pathologies before the diagnosis of chronic mesenteric ischaemia is reached. Blood tests will routinely be normal, yet typically routine bloods (including FBC, U&Es, and LFTs) will have been performed prior to the diagnosis of chronic mesenteric ischaemia being reached. Anaemia may be confounding symptoms and cardiovascular risk profile factors (lipids, glucose) may be abnormal. CT angiography is the diagnostic test of choice, providing good anatomical views of all vessels and can help gauge any intervention required; catheter angiography previously was the gold standard imaging modality but is now used less due to the improvement of CT angiography. Management plans for chronic mesenteric ischaemia are typically made jointly between the interventional radiologists and vascular surgeons. Patients should be started on best medical therapy, including an antiplatelet agent and a statin (if not already), alongside advice promoting weight loss, increasing exercise, and smoking cessation. 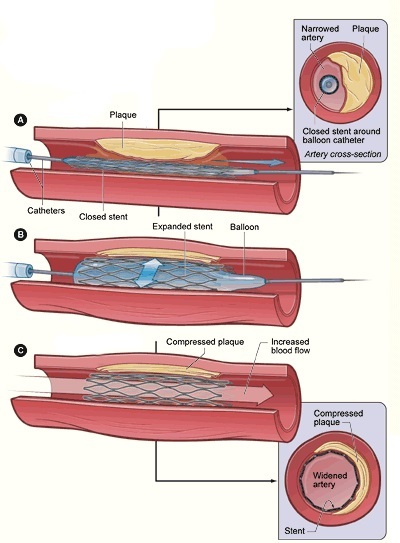 Stabilising the atherosclerotic plaque with such agents will prevent subsequent worsening of the disease. Open procedures (less common) – consists of an endartectomy or a bypass procedure. Mesenteric angioplasty is typically performed percutaneously, through either the femoral artery or brachial/axillary artery, allowing a catheter to be passed to the appropriate vessel under radiological guidance. A small balloon is expanded to dilate the vessel (Fig. 3), with any stent deployed if required. Such procedures provide a shorter hospital stay with faster mobilisation for the patient. The main complications from endovascular intervention are haematoma at the arterial puncture site, risk of embolisation, and vessel perforation. The main complications of chronic mesenteric ischaemia are bowel infarction with necrosis or malabsorption. Many patients will also have concurrent cardiovascular disease which will also require suitable medical management and optimisation. Prognosis after intervention is good, with comparable results in terms of relief of symptoms between open surgery and endovascular methods. Which of the following is a risk factor for chronic mesenteric ischaemia? Which of the following patient's has a presentation most in keeping with chronic mesenteric ischaemia?